This is a book with much promise. Neal Stephenson is a very decent writer; his prose can be both engaging and exciting, without pandering to the reader in the way many techno-thriller authors choose. Unfortunately, this is also a book that seems to have been written in an ecstasy of authorship, without enough time and consideration given to making the book a reader’s choice. My copy weighed in at over 1100 pages, which is a very long expanse for Stephenson to ultimately say very little. 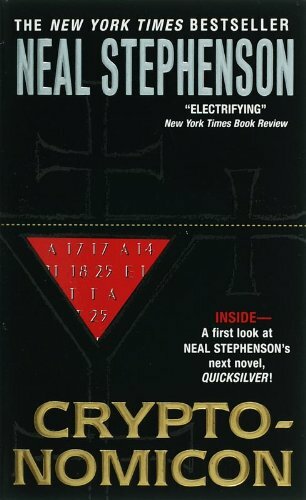 Cryptonomicon is essentially several smaller storylines all rolled into one. There are two distinct timeframes, and several major/minor characters all pursuing their own goals, occasionally overlapping along the way. The problem is that all the hopping backwards and forwards simply adds pages, as Stephenson has to constantly remind us who we’re reading about, where they are and what they’re doing. By which point, we’ve moved back 50 years and half-way around the world to another thread in the story. If you put the book down for a few days, you’ll probably find yourself reading a few chapters just to get your head around what all the various characters are currently up to, before you can continue on to something fresh. All of which isn’t to say the book doesn’t have its moments. There’s clearly a lot of time, effort and research gone into this book, and this shows, particularly in the historical timeframe and the bits dealing with cryptography. Isoroku Yamamoto’s death, for instance, is featured as a nice allusion to the importance of what the main characters are up to. Yet for all its breadth, this novel is a pure geek’s heaven, and despite the oodles of space given over to something like Van Eck phreaking, there’s little space to give the characters anything more than a lick of paint. Others have commented that the female characters are wooden objects in a male-dominated world: I’d go as far as to say the entire piece is being played out by marionettes. Whilst I wasn’t exactly expecting inner drama from a book like this, and could have suspended my disbelief for a few lack-lustre characters, there’s only so much fantasy I can take whilst reading a book gushing with technical detail. I’ve no doubt many readers would be quite satisfied with the defence of ‘artistic license’ but I found myself confusedly shaking my head a number of times reading Cryptonomicon, trying to work out quite whether I was supposed to be taking what I was reading seriously. Not satisfied with creating characters and events, Stephenson creates new countries and languages. After a few hundred pages I was already getting a bit weary of some of the characters, and a number of far-fetched/unbelievable events and entirely fictitious ‘facts’ had strained my enjoyment of the plot. But persisting for several hundred more pages didn’t produce much in the way of a reward. The picture that gradually gets revealed over this meandering epic really isn’t equal to the effort that the author (and reader!) put into it. This book has been described elsewhere as “the ultimate geek novel.” You’ll either love the book–for the winding journey, the nauseating detail, the multi-page descriptions, possibly even the cardboard-cutout characters–or like me you’ll find the whole escapade rather tedious, unbelievable, unnecessarily long, and ultimately disappointing.